We hold an official Portuguese tourist license 6431/AL. The apartment is situated at the Western edge of the unspoilt fishing village of Santa Luzia and a short drive to the historical and beautiful town of Tavira. This prime location is peaceful and very close to one of the best beaches on the Eastern Algarve. From the apartment it is a short walk to the village centre with its wonderful seafood restaurants that line the waters edge. The first floor apartment was built in 2006 and has a contemporary feel. The kitchen and lounge have floor to ceiling windows and shutters that run across the entire front of the apartment. 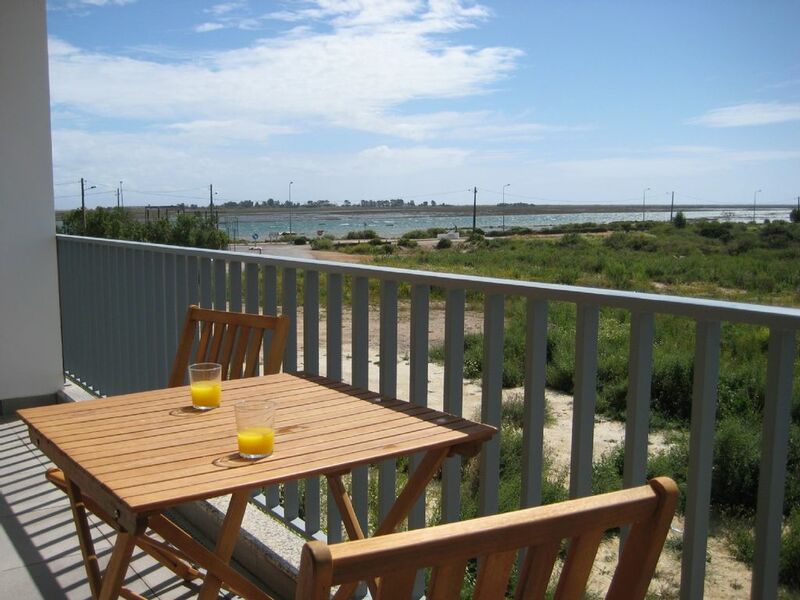 These open directly on to a good sized private balcony, with uninterrupted views of the countryside and sea waters of the Ria Formosa, a nature reserve that is a haven for wildlife. In the evening you can watch the most glorious sunsets over the mountains. The apartment is only 8km from Junction 16 of the A22 motorway, 35km from Faro and within 10km of excellent golf courses. Local amenities: The water shoot park in Loule is only 35min away and is great fun, You can also Swim with the Dolphins at Zoomarine! We have a number of excellent markets nearby (a detailed list will be in the apartment) where you can pick up some real bargains. There is an interesting car-boot near the beach of Fuzeta where you will find some unusual items. Ayamonte, 20 min (the Spanish border) town has a similar market every Saturday. Tourist resort towns with entertainment, bars, restaurants and casinos only a 10 - 40 minute drive away (depending which town you would like to visit). Finally, for those of you who do not want to just stay on the beach and want to see more of the original Algarve then a circular drive through Moncarapacho, Estói, Olhão and Tavira is well worth doing, with the A22 link this makes a good half day visit. Golf: Not only has the Algarve the best golfing climate in Europe it also has some of the best courses and facilities. To the West, Quinta do Lago and Vale do Lobo courses are within 30 min of the Apartment and Vilamoura a further 15 min further on. Benamor, Quinta de Cima and the Quinta de Ria are within 10 minutes and Castro Marim a further 15 minutes. We have 3 adult bicycles and one child's bike available for use free of charge. Guests are required to mend any punctures or any minor repairs needed as a result of using them. Baby's cot or highchair available on request. I am a working mother with 3 small children so life is very busy. I aim to get back to enquiries as soon as I can but often deal with booking and administration details in the evening when the children have gone to bed. I live in London with my family and work as an art teacher in a local FE College. We have been visiting the Eastern Algarve for many years and love the peace and quiet of the local area. The village is very relaxing and we completely unwind when we are there. We chose this property as we know the village well and loved the location.It is at the quieter end of the village and when we sit on the balcony looking out at the beautiful views we feel like we haven't got a care in the world. We love the architectural style of the building and have furnished it in a way that is in keeping with it's modernist style, with contemporary furniture but paying attention to comfort and a home from home feel. We have an official Tourism licence which is a legal requirement in Portugal. We feel in love with the views from the lounge, the large spacious balcony and the lovely interior with floor to ceiling windows that open directly onto the balcony looking over the Ria. We feel it is a very special place where the surrounding countryside, and waters of the Ria are incredibly peaceful, calming and beautiful. In springtime we can sit on the balcony and breath in the heavenly scents from the Ria Formosa below. All year around hear the many birds singing and the sound of the bells on the sheep when they come to graze in the morning. Bathroom, fully tiled with bath/shower over, WC, sink/mirror over and bidet. Air con units in lounge and bedroom supply ample heat in winter or cooler times. Plenty of parking available just outside the apartment building and a safe area. Parking is more tricky in August due to it being national holiday time in Portugal. Mini I-Pad available which is connected to smart TV so guests can watch UK and foreign TV Channels. Portuguese and English channels. English Freeview channels available via Internet. Small communal garden with a bike stand. Free of charge but guests need to make good any punctures or minor repairs resulting from their use. Our non-overlooked large terrace with beautiful views of the Ria Formosa is accessible via floor to ceiling patio doors of the kitchen and lounge. There is a Patio table with 4 chairs. Sit, relax and enjoy the wonderful sunsets. For Smokers, please only smoke on the terrace. Thank you you were a very pleasant guest and left our apartment lovely -clean and tidy. Happy you enjoyed your visit again. Comfortable and well-located with plenty of restaurants and a yummy pastelaria just a few minutes stroll away. Quiet apartment block, adequate street parking. Our second stay here, won't be our last. Thank you so much. I am so pleased you had another great holiday, it is important to us that our guests are happy. The kitchen has all the equipments , and it's possible to look some french channels on TV.The balcony is spacious and well equiped to eat and sunbath in front of the sea which is very close. The availability of bikes is a most to visit the area. My wife and I stayed in Sally's apartment from mid Septemper to start November. We enjoyed our stay very much. The apartment had anything we needed during our time there. The terrasse was the most important place in apartment. Big glassdoors to open, and including terrasse. Here we spent most of time when we not was at the beach, in Tavira or out watching birds in the salinas. It was easy to communicate with Sally in front of our stay, and we also had contact once after some weeks. All in all, this was a fantastic place to stay for 6 weeks. Thank you Sally for letting us stay in your lovely contemporary apartment. We have had a lovely time here and will definitely be back (for longer next time). The heatwave didn't put us off! Santa Luzia is such a calm place combined with friendly and beautiful. We found the food, beaches and surrounding areas just perfect! Thank you I am so pleased you enjoyed your stay. It really is a special part of the world. We had a lovely stay at Sally's apartment .A great week from watching the sun go down every evening on the veranda and eating at local family Portuguese restaurant's.we enjoyed the quiet location great views and beaches.Thankyou Sally. Thank you it was a pleasure to have you as guests and we are so pleased you enjoyed your stay. Our Apartment is situated in a superb location, only 8km from Junction 16 of the A22 motorway and enjoys the beautiful tranquility of the unspoilt Eastern Algarve in the small fishing village of Santa Luzia near Tavira. The beach Islands of the Ria Formosa are renowned for being peaceful, uncrowded, safe, unpolluted and extend for 12 km. Santa Luzia beach is 5 minutes by regular aqua taxi. Barril beach is 10 minutes walk and has a miniature train, a great adventure for children. There are beach restaurants, café bars and shower facilities. The renting of boats, windsurf boards etc are available. Within 4km Tavira offers a great range of shops and supermarkets (Pingo Doce, Lidle), bars/restaurants abound many specialising in seafood. The beautiful river Gilão runs through the centre of town and on those warm summer nights public entertainment can be found in the park by the river. Prices for the property per week in Sterling based on 2 people sharing, £35 for each extra person per week £20 per extra child. Discounts for Longer lets. Changeover day is Saturday in high season, we are flexible, please ask for details. 25% deposit is required on booking with the balance due 8 weeks before departure. Details will be sent to interested persons. Payments can be made by Bank transfer, cheque or online. Free use of bicycles and Internet and mini I- Pad . Please bring your beach towels.